There are places where the best way to ease your hunger is by fishing. Even on the best-planned trips, risks remain especially among the frost, volcanoes and rugged terrain of the world’s largest country. Our culinary guide to Russia’s regions will help you survive when exploring some of its more gastronomically challenging provinces. For centuries Yakuts have eaten horsemeat during severe frosts when it’s impossible to go hunting or fishing. Young horsemeat is nutritious and contains elements that delay aging. The meat is chopped and boiled with fried onion, salt and pepper for 15-20 minutes. Boiling horsemeat for longer than that is not recommended as it becomes chewy, hard and tasteless. The cooked meat is served after being cut into thin slices. Chukotka could be found at the bottom of any list for food tourism and local dishes can horrify even the most intrepid of travelers. Some local delicacies are so weird that you wouldn’t even want to be in the same room as them. Take the local specialty “kopaika” for example: the meat and fat of a gray whale are placed into a sack that is buried underground for one month. Local gourmands insist that this creates “an incredibly healthy and nutritious substance.” At least that’s what they told me. If you ever happen to make it to this far-flung corner, try “mantak,” arguably the most edible of local dishes. You begin by chopping whale's skin and fat into pieces and then boil for 20 minutes in a pan. Before eating don't forget to ask the spirit of the whale for an apology. In Chukchi mythology the whale is the forefather of everything on Earth. In this region whale's meat feeds families, bones are used for building houses, clothes and boats are made out of its skin and the fat is used for the lighting and warming of their dwellings. The list of “bloodthirsty” recipes continues with the Mordvinic specialty called “bear's paws.” Luckily, to taste this dish you don't have to kill a bear – this unfortunate name refers to a simple cutlet. According to legend, many years ago a poor Mordvinic young man wanted to marry his beloved. The father of the girl had one condition: the man could marry her if he killed a bear to prove his strength and courage. The brave young man managed to kill a bear and he fried one of its paws to present to her. Nowadays “bear's paws” are coked of beef, pork and beef liver. Egg, spices and chopped onion are added to the ground meat and long rye crisps are placed on top to symbolize bear's claws. Here you will find a wide variety of ingredients for cooking here, especially when compared to Russia’s northern regions. The favorite dessert of the Don Cossacks is watermelon honey. First, get a large ripe watermelon from the garden, clean it and let it dry. Cut it into pieces and separate the fruit’s flesh from the skin and press the flesh to produce watermelon juice. Boil the juice in a pan, stirring it constantly until it turns into an aromatic, thick and dark-colored syrup – this is what watermelon honey looks like. If you fancy a meal on the Kola Peninsula, the best way to ease your hunger is by fishing. One of the biggest local rivers, the Umba, is considered to be the best place in the world to catch salmon: they lay eggs up to five times a year here, meaning that there is a constant flow of fish. But don’t let your guard down too much here: brown bears take up their positions on the river banks right next to humans. 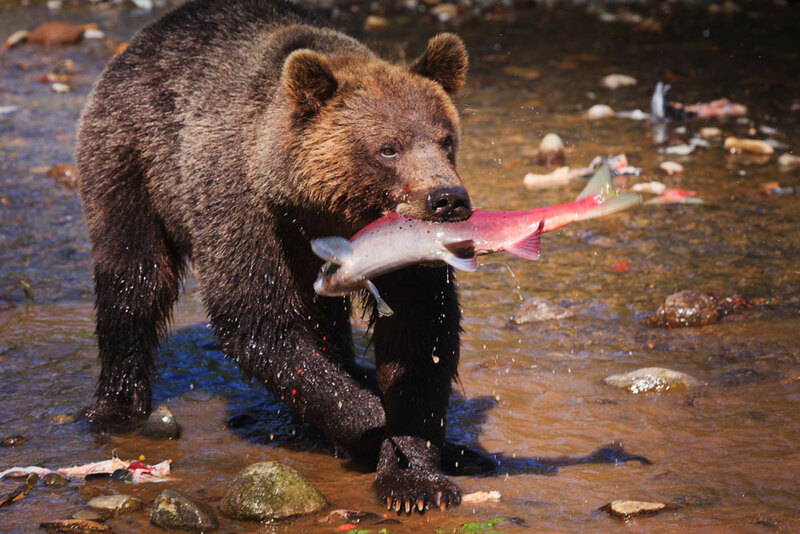 Don't try to compete: leave your catch to the bears and run, otherwise your catch could become your last. If you happen to get lost in the Astrakhan steppe, try to find a house of “chabans” or local herdsmen. Steppe inhabitants are famous for their hospitality, so it would be very surprising if they let you cook for yourself. More likely you will be an honored guest and invited to try local dishes. The first course will definitely be a “beshbarmak,” a huge plate with meat. This word means “five fingers,” which is why you shouldn't look for forks or knives on the table. The ingredients are simple – boiled mutton, dough and onion. To eat dip these ingredients in a hot meat broth. Even if you are not a fan of sour milk products, you should try kumis, something like a milk wine, which contains a small amount of alcohol. Kumis was a basic drink of the merchants traveling along the Great Silk Road, who knew a thing or two about extreme travel. After long and tiring trip a wanderer surely needs a cup of energizing coffee. In Buryatia every welcoming host will gladly offer you a cup, which unlike other Russian regions is as popular here as tea. Don't be surprised though when you detect a distinct salty taste. Coffee is prepared here according to a special Eastern recipe. Buryat tea has an unusual taste too: they add not only salt, but also flour, milk and butter. The first thing that Sakhalin Island locals will tell a hungry traveler to do is to find some “burdock,” a root vegetable commonly eaten in Asia. The recipe is very simple: place green sprouts of burdock in cold water for some time to get rid of the grassy smell, then boil them for 20 minutes in salted water. When ready, peel the stalks and cut them into pieces, and deep fry them in heated vegetable oil. Add some salt and pepper, sprinkle them with some soy sauce, add sesame or pumpkin seeds, throw in some onion and garlic and simmer until cooked. Bon appetit!